Madagascar is known as the world’s eighth continent and the Galapagos of the Indian Ocean with wildlife accolades almost outnumbering its curious endemic species. This African island is an adventurer’s dream from its dense forests and uncharted rivers to its brooding granite peaks. Taste it all on this epic trekking and rafting adventure next spring. 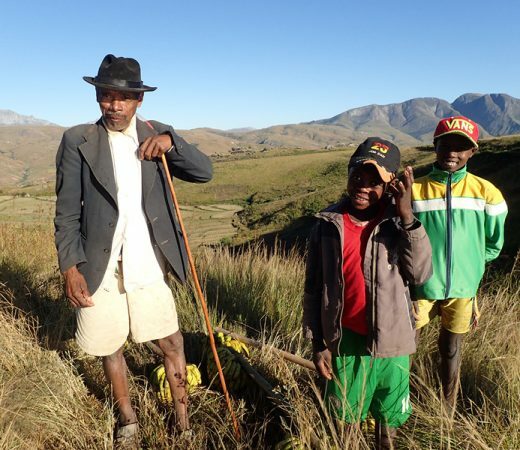 The aim of this epic expedition is to cross the African island of Madagascar from peak to sea. 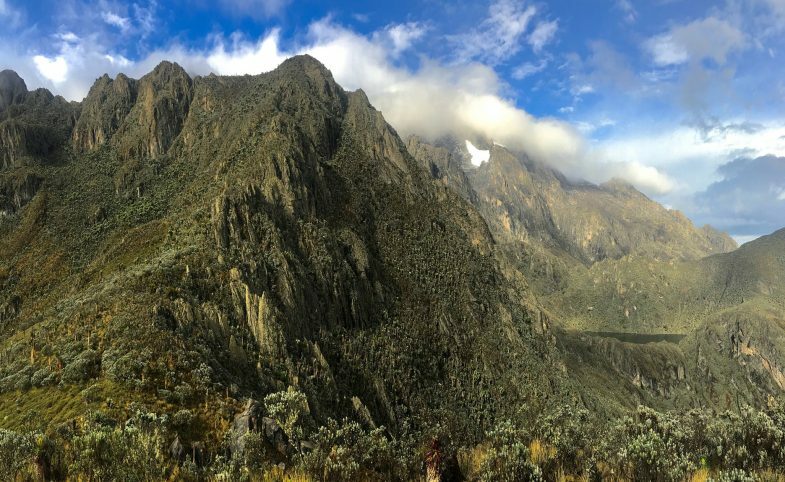 The first goal is to trek to the summit of Pic Boby, also known as Pic Imarivolanitra and Madagascar’s second highest mountain at 2658m, a towering presence over the lush Andringitra National Park reminiscent of the famous granite peaks of Yosemite National Park in California. 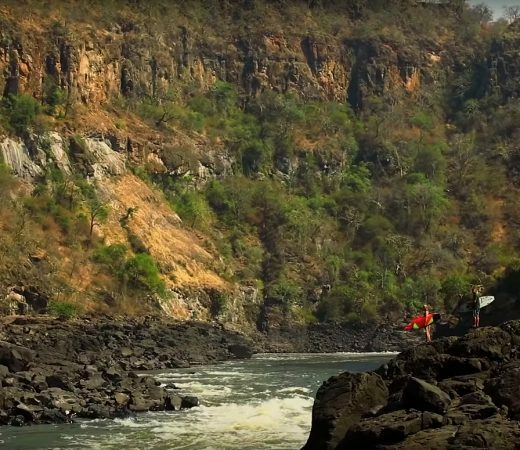 Then, descending into the valleys and forests to the east, the team will use local trails and animal tracks where possible or forge a new route through dense vegetation to reach a remote jungle river and the second stage of the challenge – a river journey. By means of two-person inflatable rafts, teammates will navigate their way from the granite highlands, through the rolling lowlands and finally to the island’s eastern Indian Ocean shores. Raft a wild African river to the shores of the Indian Ocean. “Very challenging, but very rewarding. It was an experience of a lifetime. One that if you never got out and hiked, you would never ever see and meet the great people we did. The landscape was beautiful. Every day completely different to the next” – Tracy Dulak, 2016 teammate. 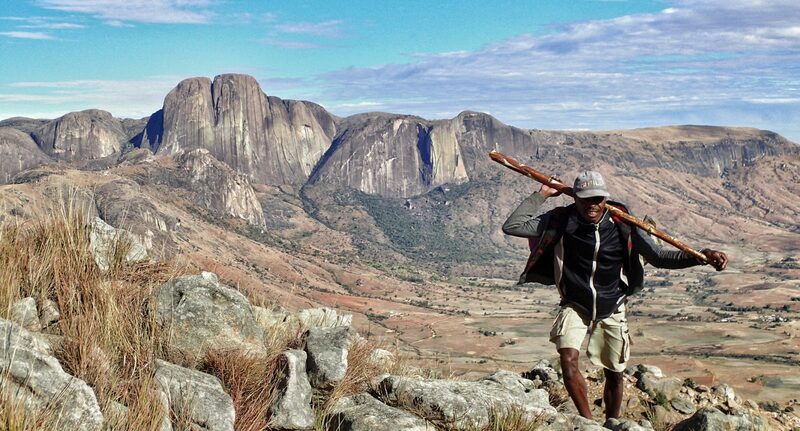 Pic Boby is Madagascar’s second highest and arguably most impressive peak at 2,658m. It is a trekking peak so no technical equipment or skills will be required. Also known as Pic Imarivolanitra meaning ‘close to the sky’, the peak is at the heart of the island’s Andringitra National Park. 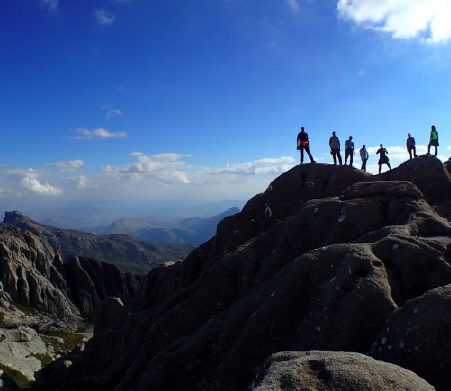 With its huge granite outcrops, waterfalls and rock formations, Andringitra has been likened to Yosemite. Two legendary waterfalls in the region are Riandahy (the Queen) and Riambavy (the King). Though often calm and sunny with wide-ranging views over the National Park and beyond, temperatures can drop quickly and conditions deteriorate, a swift reminder of altitude for the team! This varied peak to sea expedition is a truly action-packed adventure, ticking all the boxes. There are mountains, rivers, waterfalls, scrambles, views, jungles, communities and culture, wild camps, unique species, legends, seclusion and more – perfect for those who want to try new experiences, learn a new skill or can’t decide which activity they want to try next. In the main this expedition is far from roads and offers the intrepid adventurer a huge diversity of landscapes in a short, intense period of time, really making the most of your annual leave allowance. Colloquially called ‘hot dogs’, the two-person rafts used for the river and white-water section are perfect for expeditionary travel. They are robust, stable and capable vessels that are easily controlled – even if you’re new to paddling. 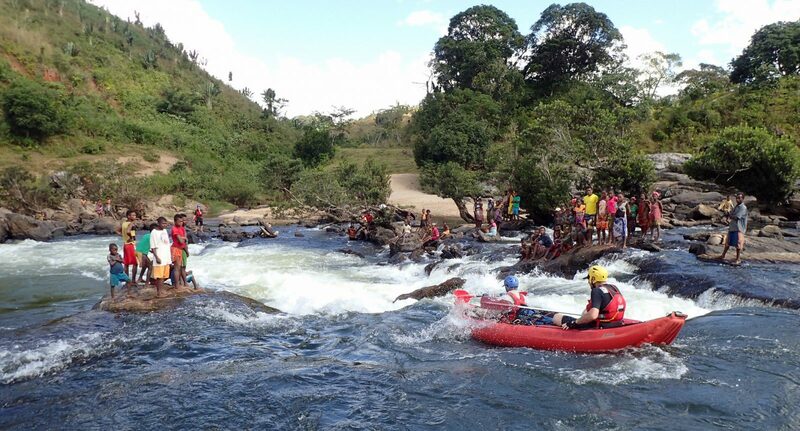 This rafting route from Pic Boby to the Indian Ocean is rarely explored so you can expect crowds of inquisitive locals on the shore as your team passes through or around your camps. Your experienced Secret Compass guide is swift-water rescue qualified, and the river phase also has on-the-ground support from our in-country partners. Even if you’re new to rafting, you are welcome to apply for this team. Rather than guided tours with set daily plan, Secret Compass runs expeditions with framework itineraries. Read more about our Approach here. 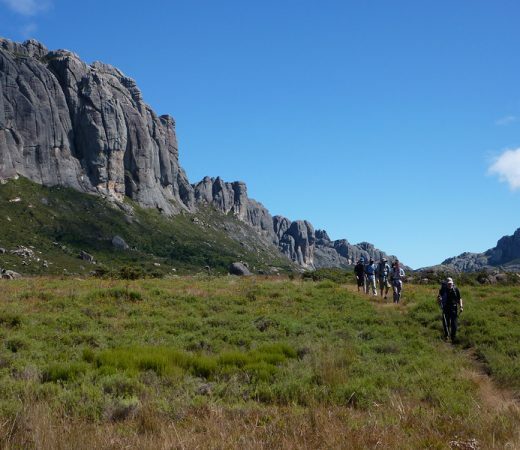 The following is the outline plan for this epic Madagascar Peak to Sea expedition – the ‘substance’ rather than the specifics. A fuller itinerary is provided in the Madagascar Expedition Handbook which is available on request or upon application to join the team. All teammates will arrive into Madagascar’s Antananarivo Airport by 1800. The expedition officially begins this evening at a local hotel, with an introductory brief and welcome dinner with your leader and teammates before an early night. It’s then up at 0430 for the long drive to the beginning of the trek and to set up camp for the night. The drive can be quite an adventure in itself – past teams have had to help repair bridges before they can be crossed! 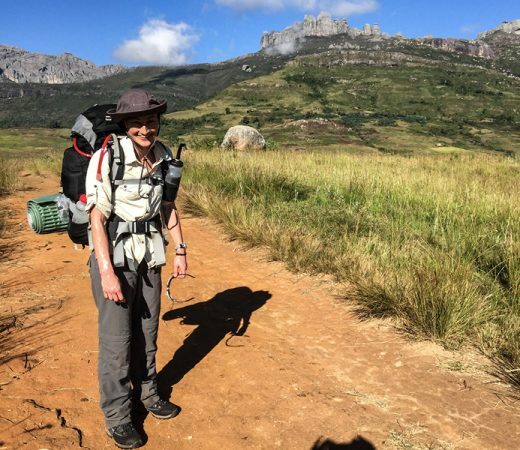 Day three is a more relaxed acclimatisation and kit check day before a short trek into Andringitra National Park. Let the adventure commence! 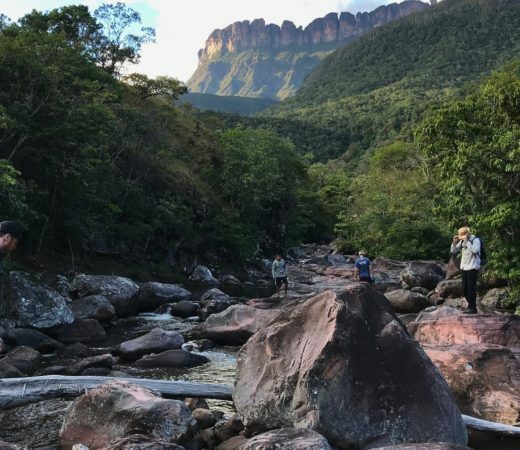 Over the next five days, you’ll trek and scramble through the Madagascan wilderness in the heart of the Andringita National Park. You’ll take on and summit Pic Boby, leaving larger bags at a base camp. Leaving the shadow of Pic Boby behind, you’ll then move through rolling hills and farmlands past villages overlooking rice paddies. The footpaths connecting these small villages wind up, down and around rolling hills, and fruit and supplies will be purchased en route. You’ll wild camp all the way, on sheltered hillsides and near villages. Expect strange looks: outsiders are rarely seen here. Leaving open farmland, the expedition route dives into almost impregnable forest and the going gets tougher. The trading currency is rum and you might spot locals carrying 45kg rum barrels on one shoulder along tiny overgrown tracks to the highland markets (complaints about heavy rucksacks tend to stop at this point). Depending on recent conditions, the path may be steep and slippery with regular river crossings to contend with. Emerging from the forest into the lowlands you’ll hit the river for the five-day rafting section. After an afternoon of training with your expert leader, settle into the expeditionary two-man rafts for a welcome break from the previous days of trekking. Paddle down-river and negotiate a series of rapids, some of which will be portaged (walked around) due to their complexity. The river mellows towards the coast, allowing you to relax and enjoy the contrasting scenery of the rural lowlands as the number of settlements increase as you travel East. Push on to meet the river’s mouth on the Indian Ocean shore. Mission accomplished! Elated at the shore having completed ‘the peak to sea’, you’ll be driven to a local hotel for a celebratory drink, meal and sleep. Contingency days are worked into the trek/raft section to aid completion within the time frame although as with all expedition itineraries there will be flex and readjustment along the way. On the penultimate day of your adventure you’ll be driven back to Antananarivo (known as Tana) for a farewell group meal at your comfortable hotel. 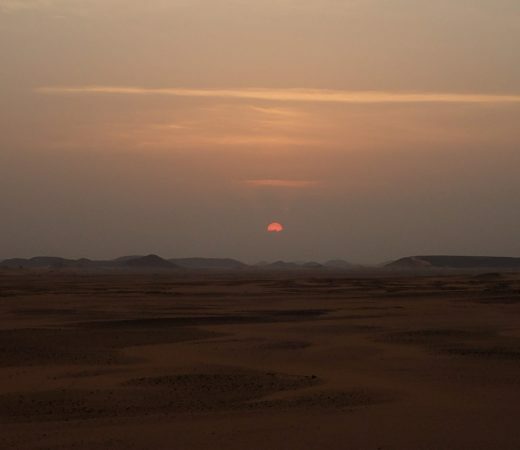 The expedition officially ends after breakfast on 10 May, with teammates free to arrange their own taxis back to the airport for outward flights at any point today (including the early hours of 10 May). Secret Compass expeditions are achievable by anyone with a healthy lifestyle and a good level of general fitness. Team members should be willing to be part of a team working together to achieve the goal of the expedition. 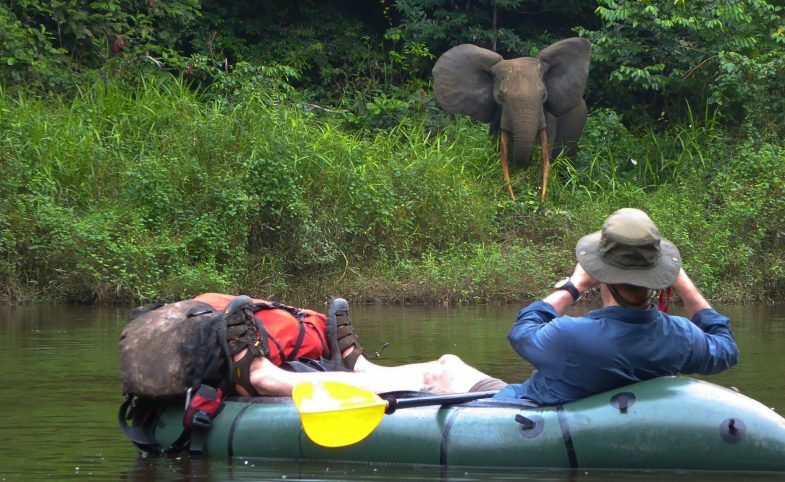 The biggest challenge on this expedition will be the long days trekking through rarely visited forests and jungles and some challenges days on the river. 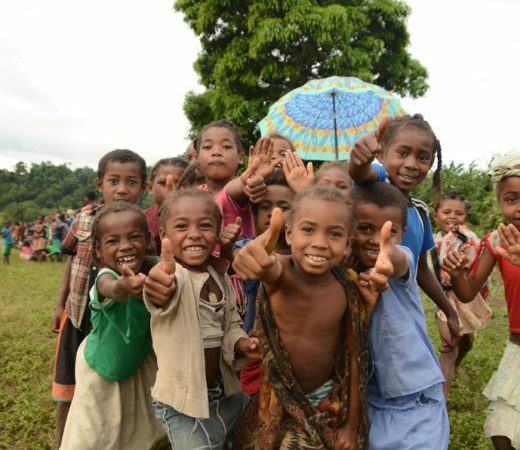 Applicants will receive a Madagascar Handbook with further expedition information. Rafting beginners are welcome on this team, see FAQ section. Teammates who arrive without meeting minimum fitness requirements can jeopardise themselves and the expedition’s goal so do take training seriously, prepare as appropriate and arrive fit and ready to go. Teammates must be comfortable with the following. Trek: up to 25km per day with daily ascents of 1000m+ likely. Paddle: up to 30km per day in two-person rafts. Carry: 10-15kg of own kit and equipment. Terrain: mountainous and tricky jungle terrain on foot. Flat water, whitewater and rapids in rafts. Swim: strong swimmers who can swim at least 200m and are capable of pulling themselves back into a raft if needed. Age: over 21, fit and healthy. Specialist Secret Compass leader with full medical and communications kits. Local guides and support team. All accommodation throughout including tents. Rafts and rafting equipment in country. 24 hour UK-based Operations Room. International flights/ travel to and from Madagascar. On application to join this epic expedition to Madagascar, potential teammates will receive a detailed Expedition Handbook. Here are some expedition-specific questions and our general FAQ will answer many other questions. Get in touch if your question remains unanswered. No. Due to the rafting element of this epic expedition and its many river crossings, being a confident swimmer who’s able to swim at least 200m is a prerequisite. Teammates also need to be fit and strong to be able to pull themselves back into the rafts from the water in case of capsize. Training will be given in country and a water session or two before departure are also recommended. Can I get raft training? Complete rafting beginners are welcome to join this team, although more experienced paddlers or those wishing to train in advance are also welcome. The types of boats are two-person inflatable rafts that are colloquially known as ‘hot dogs’. Local watersports centres will be able to advise on a training day close to you. Basic training for teammates will also be provided once in-country by your Secret Compass leader . 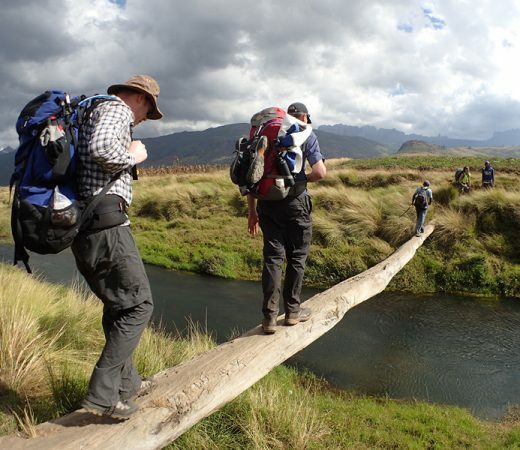 This expedition is supported by local porters for the trekking section. The porters will assist the team in carrying tents, food and cooking equipment during the trekking phase with team members responsible for their personal kit. There will be sections of the river that can’t be rafted so all equipment will need to be ‘portaged’ by the team, teammates must be prepared to carry all kit, equipment and water as outlined in the expedition handbook. 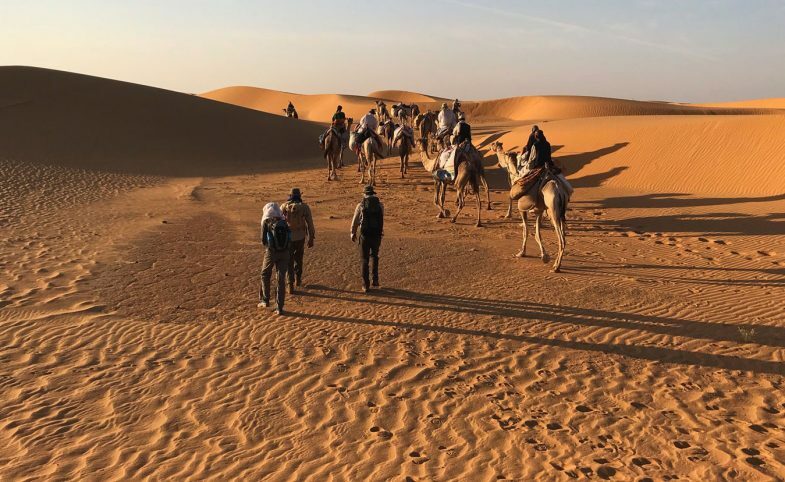 As The Plan outlines, there is a chain of transport to get teammates in position to begin this expedition and so start and end dates are not flexible. You are, however, welcome to extend your trip either before or after the Secret Compass dates – please just make sure your visa will be valid for your entire stay. Will there be raft training in country? The expedition leader is swift-water rescue qualified and there is a local support team in place for the rafting section of this expedition. The team will be briefed on paddling techniques (steering, capsize, whitewater etc.) at the beginning of the paddling phase. As with many rafting trips, there is the chance of being taken under water for a few seconds – which might feel like longer! Often, this simply means is that you then swim or float downstream to the next area of calm water to regroup with the team. It’s hard to be specific on this front due to changing water levels. The hardest rapid could be a Grade 4 with many at the Grade 3+ level. The water levels and current conditions will have a large impact on which of the rapids will be run in the rafts and which will be portaged around.